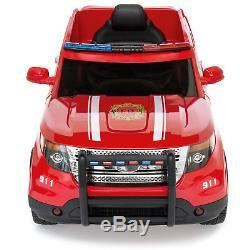 Best Choice Products 12V Ride On Firetruck w/ Remote Control, Megaphone, 2 Speeds, LED Lights (Red). Grab your firefighting gear; its time to roll out! 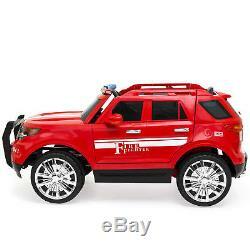 Race to the scene at a whopping 5 mph with your realistic siren, emergency lights, and horn. 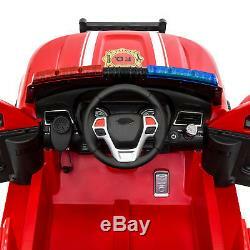 This ride-on firetruck can be operated by your little firefighter, or by a responsible adult with the provided remote control. Sound the alarmlet everyone know youre on the way to save the day! Firetruck can be operated manually or remotely. Built with a functioning megaphone. LEDs are built into windshield, side mirrors & headlights. 6 preset songs and included AUX cord. Realistic siren, engine sounds, horn, and functional doors. 2 speeds: High and low. Overall Dimensions: 45(L) x 25(W) x 22.5(H). Seat Dimensions: 14.5(L) x 8(W). Leg-Room Dimensions: 12(L) x 16(W). Control Battery: (2) 1.5V AAA (not included). Recommended for children ages 3-6 yrs. 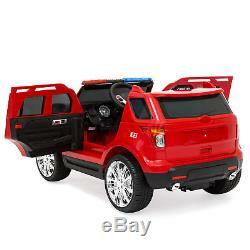 Includes: (2) 12V Motors, (1) 12C 7Ah Battery, (1) Charging Cable, and (1) Remote Control. Items received without an RA form may not be accepted or may increase your processing time. If an item is received damaged customer service must be contacted within 7 days of receipt. All defective and damaged items require an RA (Return Authorization) number which will be given by a Best Choice Products Customer Service Representative. It is at the company's discretion whether the item be sent back to a Best Choice Products Return Center. How quickly your replacement product ships after that depends on product availability. Monday - Friday 6:00 A. 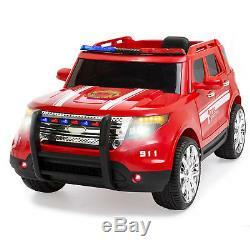 The item "12V Ride On Firetruck with Remote Control, Megaphone, 2 Speeds, LED Lights (Red)" is in sale since Thursday, February 22, 2018. This item is in the category "Toys & Hobbies\Electronic, Battery & Wind-Up\Battery Operated\1990-Now\Ride On Toys & Accessories". The seller is "bestchoiceproducts" and is located in Ontario, California. This item can be shipped to United States.